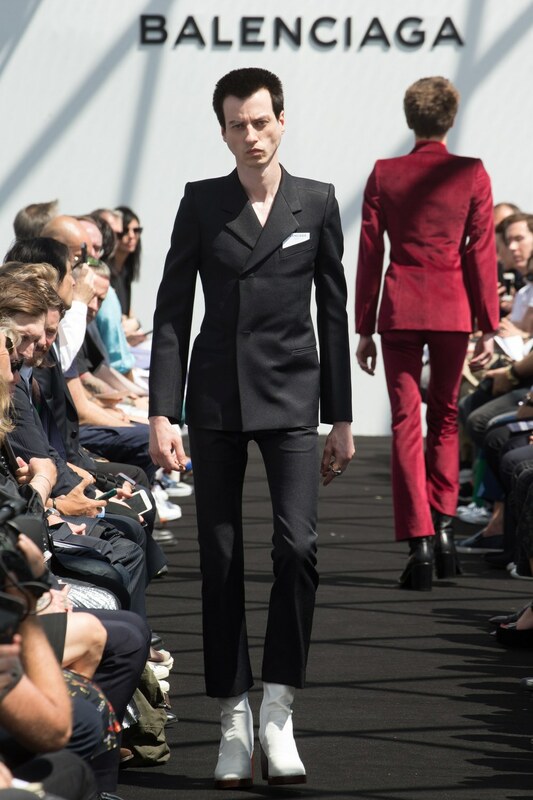 This afternoon in Paris was the first ever men’s Balenciaga runway show. Under direction of the new Creative Director, Demna Gvasalia, this historic occasion has been meet with vast hesitation and has left many wondering if this is the beginning of the downfall of yet another major fashion house. While the financial market and social climate continue to change and shift, what does this mean for the major luxury houses that we all revered just a few years ago? I will admit that I have been a secret skeptic of the decision to appoint Gvasalia to the head of such a historic house that has literally changed the way we dress, and has been such a consistent influence on style and fashion for the past 70 years. At the time of his appointment Gvasalia was relatively unknown outside of the Paris fashion scene, only recognizable by his uber chic, but little known Vetements line. With leadership roles at Margiela and Vuitton under his belt, was the 35-year old ready to head the entire branding and creative direction of one the biggest and most recognizable luxury brands in the world? Let’s do a quick break down of today’s menswear collection. At first glance the average person is going to chuckle and say WTF!?! But if you take a minute to understand the history of the brand and realize the detail in the collection one might have a change in sentiment. Looking at the opposing play on proportions you might think on the surface these are extremely contradictory silhouettes. But if you peel away the layers and look at the consistently exquisite tailoring you realize that Gvasalia is as much a pendant for construction as Cristobal Balenciaga himself, and then appreciate Demna’s humility and respect towards the rich history of the house. His penchant for artistry is apparent and despite its dual fits there are a lot of very wearable clothes in between that could easily integrate into any wardrobe. We have to remember that fashion shows are largely PR and not everything you see on the runway is what goes into production. A runway show is simply the designer’s platform to present the purists vision of his work. By the time garments hit department stores and boutiques they will be filtered down to consumer friendly inklings of the runway looks. Just a few thoughts.